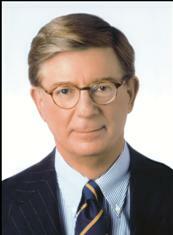 A night with Pulitzer Prize-winning columnist and Newsweek essayist George F. Will is the country’s most widely read political columnist, as well as its foremost conservative voice. His popular twice-weekly column for The Washington Post syndicate reaches nearly 500 newspapers throughout the United States and Europe and he appears regularly on ABC television’s This Week. Perhaps there’s no political acumen more finely honed than Will’s. And perhaps no one has more or better insights into the issues and political realities of today. As one of the most respected and sought after political commentators on the national scene, he provides an informed and expert view on the issues. He is a prolific author with books ranging from The Woven Figure: Conservatism and America’s Fabric to Bunts to his latest, One Man’s America. In 1990, Will published Men At Work: The Craft of Baseball, which topped The New York Times best-seller list for two months and was most recently reissued on April 13, 2010 as a 20th Anniversary special edition with a new introduction (paperback).